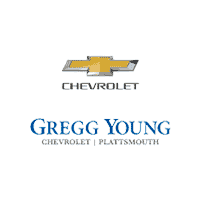 Gregg Young Chevrolet of Plattsmouth is Your Premier Rocky Ridge Lifted Truck Provider! 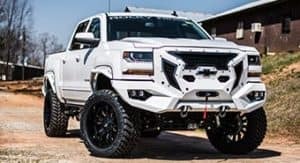 Find custom lifted truck packages for a range of Chevy vehicles. 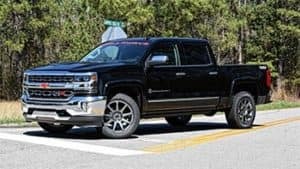 With ten different custom packages available for the Silverado 1500 and 2500, you’re sure to find the right truck for you. From conquering the outdoors to looking stylish in the city, you can’t beat the feel and performance of a Rocky Ridge truck. Plus, we do much more than offer custom lifted trucks. We also provide custom upfitted Chevy Tahoe SUVs that are ideal for almost anyone. 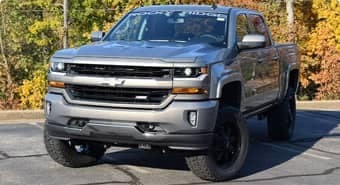 Check out the full spread of Chevrolet custom lifted truck packages available from Rocky Ridge. Click below to pick your model and see what we have in store. The Altitude package from Rocky Ridge is the definition of a big bad truck. When you want to take your 4×4 truck to the next level, you want the Altitude. The 6-inch custom-developed Rocky Ridge suspension lift kit puts you above the competition. Off-road wheels and tires make it even bigger for a lifted truck that can do just about anything. 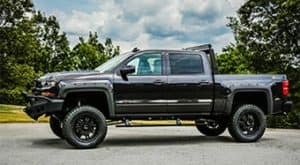 Of course, all of our Altitude packages come with the incredible 3-year, 36,000-mile warranty you’ll be hard-pressed to find with any other custom lifted trucks. You could almost call the Alpine the business class of big bad trucks. 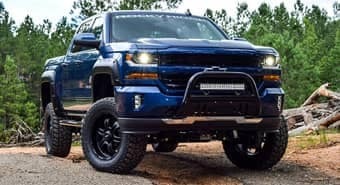 You still get the same bold look and performance of a custom lifted truck, outfitted with our custom-developed 4-inch Rocky Ridge coil-over performance lift kit. This offers a smooth ride and improved handling on dirt roads and highway commutes alike. It also comes with premium style and presence inside and out, giving you an exclusive experience every time you drive. Want a lifted truck that’s ready to dominate the outdoors? Look no further than the K2 edition from Rocky Ridge. We created this package to match the attitude of the “Savage Mountain” itself, the world’s second-tallest peak. With a huge lift, black wheels, and tough tires, the Rocky Ridge K2 is prepared to take on any road or any trail with real presence. Like all of our packages, the K2 comes with a 3-year, 36,000-mile warranty, so you’re covered. Looking for a truck that’s ready to take over the highway? The Silverado Enforcer gives you supercharged performance that can’t be slowed down. Rocky Ridge and Edelbrock have joined forces for a truck that’s ready to blow away the competition, with all the horsepower you’ll ever need thanks to its Edelbrock TVS 2300 supercharger system. With 534 and 633-horsepower options, the Enforcer takes the Silverado 1500 and turns the volume up to 11. There are big bad trucks. Then, there’s the Stealth edition from Rocky Ridge. This custom lifted truck brings you all the perks of a Rocky Ridge package with extra style and serious toughness. Rocky Ridge applies its textured Stealth Armour coating for a durable added layer of protection that also looks awesome. Naturally, all Stealth models come complete with a 3-year, 36,000-mile warranty, so your truck is as protected as you are driving it. Have you ever seen a flyover from a B-2 Stealth Bomber? The plane cuts through the sky with sleek, black wings that cast a shadow over everything in their path. There’s nothing like the B-2—until you’ve seen the Stealth XL package from Rocky Ridge, that is. This truck features our textured Stealth Armour coating all over the entire vehicle. That means it’s protected from most minor surface damage. It’s also lifted and fitted with all-terrain wheels and tires for serious trail-ready capability. When you get behind the wheel of this custom lifted Jeep Wrangler or Chevrolet Silverado from Rocky Ridge, you’re going to feel like you can go anywhere and do anything. These custom lifted Jeeps and custom lifted trucks will give you the power to completely conquer the outdoors. This beast also has an aggressive look that will turn heads everywhere you drive it. The Mad Rock package from Rocky Ridge is a mean off-road machine ready to ford streams and climb mountains. Why get a Rocky Ridge Vehicle? Rocky Ridge bulds lifted trucks to the same standards as the manufacturer, so all vehicles come backed by an outstanding warranty. Because upfitted vehicles are our only focus, we bring you only the highest levels of quality on the market. Rocky Ridge pushes the limits of lifted truck technology every day to expand what’s possible for you. 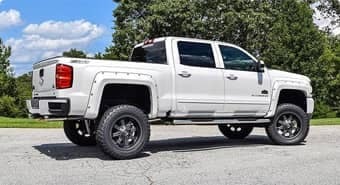 With custom developed packages and components, Rocky Ridge strives to be at the cutting edge of what you expect from your truck, inside and out. You need to trust your vehicle as much as you trust yourself, so Rocky Ridge delivers dependability you can count on. In fact, all of their techs have at least 1,000 builds under their belts. With that kind of experience, you know you’re getting the very best.